Even though it’s cold outside, I’m still drinking my detox smoothie for breakfast every morning. I just feel so much better when I start my day off with a healthy infusion of fruit, vegetables, antioxidants, bioflavonoids, protein and the ever-important ingredient: water! As much as I like change, I still prefer to eat the same thing most mornings. I just don’t want to think too hard about breakfast, unless it’s a special one like Christmas morning or when my kids are in town. So, I’m perfectly happy to eat the same old blueberry smoothie I’ve been making for years. Sure, I’ll sometimes throw in a slice of ginger, a piece of beet, or some fresh fruit that needs to be used up. But it’s basically the same smoothie. Well, today was different! I decided to really go in a different direction, focusing on winter oranges and a little cayenne pepper to heat things up! You will need a powerful blender like a Vitamix, Ninja, or NutriBullet. 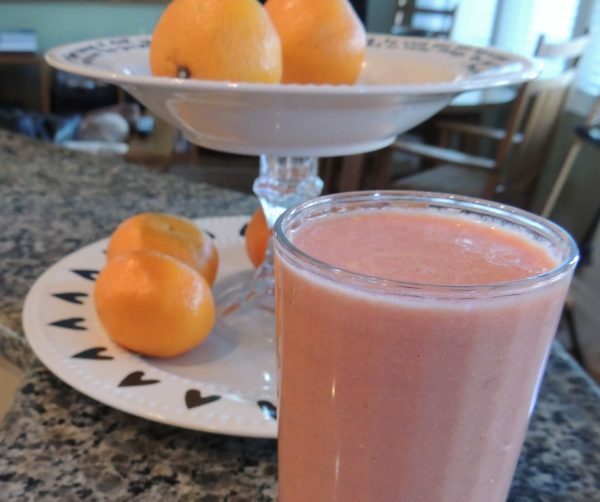 This smoothie is a beautiful blend of hot, sweet, sour, and cold! It's packed with vitamin C, bioflavonoids, quercitin, vitamin B, potassium, protein, and good fats, along with ginger and cayenne to aid digestion and metabolism. Although this is listed as 1 serving, it could easily serve 2. Taste and add more lemon juice, ginger, or cayenne, to taste.